There is lot of controversy on PM Modi’s original horoscope . Reason is that there are two dates of birth circulating in media as per his official and academic certificates . In this analysis , I am trying to establish the horoscope as per his original birth date of 29 August 1949 as per his High school leaving certificate . When I was studying for Jyotish Acharya course in Bhartiya Vidya Bhavan’s Institute of Astrology , run under Sh. K.N. Rao‘s guidance , I was told by several teachers , not to rely living politician’s horoscope as they deliberately spread several false birth date , so that nobody knows their real birth chart . Sh. K.N. Rao also said the same thing in his various books . The real horoscope is made available only after death of such politicians . One very notable point is that , Ascendant sign is at beginning at 1 degree, Sun , the planet for Government benefits is at 0 degree, Mars , the ascendant lord is at 0 degree and Mercury , the planet for communication and intelligence is also at 0 degree. Then Saturn , the planet for popularity and politics is at 29.5 degree . The general rule of Awasthas of planets says that planets in beginning or ending degrees are in Balaywastha ( childhood) or Mritaawastha ( dead like ) so here Sun, Mars , Mercury , Saturn are in those states hence quite weak . Some astrologers would come up with better situation in Navansha D-9 Chart . Situation is not changed much there and Mars , the ascendant lord has become debilitated in D-9 . I never found this chart convincing enough . It does not portray his personality , his past or present situation . A Scorpio ascendant and Moonsign person would never be vocal .Mars sitting in Lagna in his own house should make him money hoarder and army like temperament of non-communicative and secretive disposition . His second house of Family / Voice / Money is free from any afflictions but at the same time it has no exceptional quality by this chart . The chart shows his seventh house lord as Venus which is well placed in 10th house of Profession , so he should have his spouse in politics . In short , by general rules of astrology , the chart does not have any peculiarity . It does not explain his grey, balding hairs since younger age , his separation from wife just after marriage . It shows an afflicted Sun with Ketu which is not good for such high political post . His current Mahadasha of Moon from 2011 to 2021 does not show exceptional rise as it does not relate to 10th house of profession . There are many issues like punctuality , popularity , administrative ability of PM Modi which this chart just does not explain ! So, I never believed this official birthdate and birth chart of PM Modi , while other astrologers have been making big predictions based on this chart . 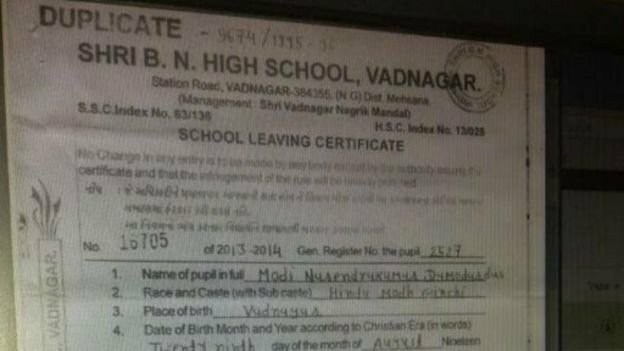 The New Date of Birth of PM Modi Surfaces.. This chart does more justice with his personality than earlier chart prevailing in internet sites ! Let us see main features of this chart ..
Ascendant lord Sun is in its own sign Leo in ascendant with its arch enemy Saturn within 3 degrees . So, his Sun like personality is justified and his punctuality , administrative skills , controlling and dominating tendency is very clear from this chart . His grey hairs in young age are supported by close Sun-Saturn combination. Jupiter in its own sign Sagittarius in good 5th house , aspecting 9th house of Luck and ascendant /ascendant lord Sun give him much needed luck factor to reach to PM’s post . 3.His second house of family / voice / finance has Mercury, Venus and Ketu . Mercury adds to his speaking ability while Venus+Ketu shows his afflicted Venus , showing poor marital life prospects . 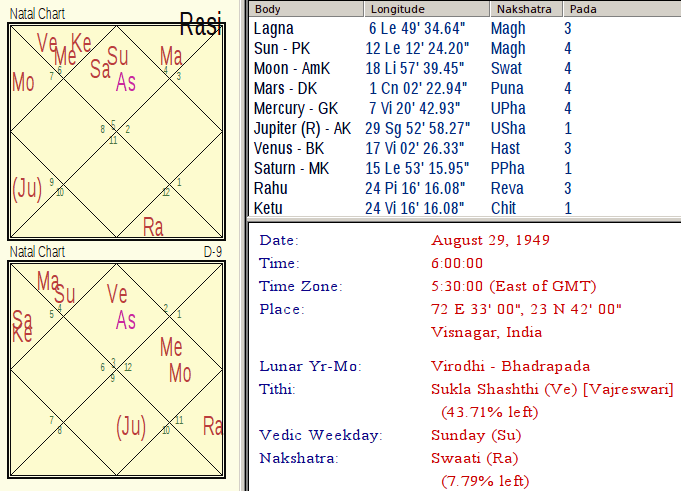 Rahu-Ketu axis falling on second house and 8th house of in-laws show deficiency in family and in-laws house . 4.His Moon is in third house of communication / publicity, being lord of 12th house of strangers , foreigners and non-blood relatives . That shows his focus on propaganda . He likes meeting , contacting his foreign counterparts while he hesitates meeting his own family members . Moon as lord of 12th house made him leave his ancestral home , wander length and breadth of India and now he has visited almost all countries of world . He is quick in giving reactions to international events more than events in Gujarat or in India . His Moon has 3rd aspects from Saturn and 4th aspect from debilitated Mars in 12th house . These are contradictory aspects as Saturn and Mars are inimical planets . Because of this , his speeches and his performance create controversies and debates . He is quite assertive because of Mars while he talks about poor’s schemes and their upliftment because of Saturn being in ascendant and 3rd aspect of Saturn on Moon . But finally he behaves like a King, signified by Leo ascendant and Sun being in it . His 7th house of opposition and spouse is ruled by Saturn , the arch enemy of Sun . 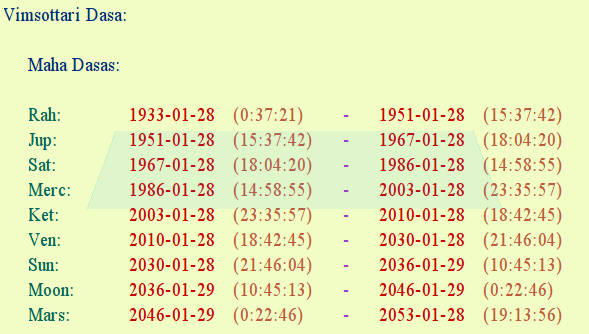 So he lost marital bliss , there being no Jupiter aspect on 7th house but Saturn aspecting 7th House . At the same time , Jupiter has 9th aspect on Saturn , the 7th lord , so he is legally married and has surviving wife . That is supported by weak Venus also . He was married at the age of 18 in 1967 in Saturn-Saturn period. Saturn is 7th lord of marriage in his chart. The Sun+Saturn combination in lagna is best for getting a good govt. service or post . Democracy is considered under Saturn only because mostly poor people vote and bring Sun people in power . Popularity is always under Saturn as it is planet for people while Sun is for govt. post . With Jupiter aspect on this combination , he got huge luck support of Poorva Punya of 5th house . He was directly made CM of Gujarat in Mercury-Saturn period and 8th transit of Saturn in October 2001 . Before that he had never held even a post of councillor . And then he directly rose to become PM of India in Venus-Sun period . Venus being 10th lord of Profession and Sun is ascendant lord and signifier of Govt. top post . 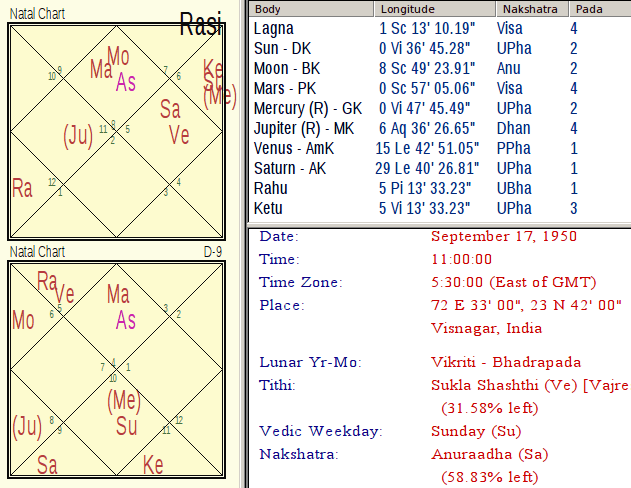 Ketu has added peak as Ketu gives Mars results which is 9th lord of luck . So Ketu Mahadasha increased his prospects during 2003-2010 and despite controversies which are part of Ketu characteristics , he sailed to top post leaving other veterans behind in race to PM . In Venus-Venus period during 2010 to 2013 , he worked out his strategy to get PM’s post candidate and in Venus-Sun period he got it . As seen from above dasha table , Venus will operate its first half of 10 years till 2019 end with 3rd house of performance results . If he gets second term after May 2019 , the dasha shows that he can win even 2024 elections also when Venus will be giving results of 10th house of name , fame . But before that he has to clear two bad antardasha of Mars and Rahu which are placed in bad 12th and 8th house . Elections are to be held in his Venus-Rahu period and that makes his re-election challenging .Thereafter , Jupiter and Saturn antardasha are good for him . Venus is planet for good sense of dressing , eating , touring and presenting oneself , so his current Venus period gives him that opportunity, whether one likes it or not . He is undergoing Saturn’s Saadesati from Sept 2009 till January 2017 as per Libra Moonsign . He will have Saturn in 3rd house of performance during Jan 2017 to Jan 2020 . 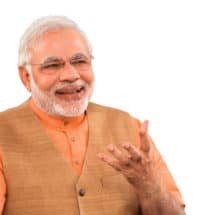 So, he will have good Saturn transit results when Loksabha elections are held in mid 2019 increasing his chances for winning , though Rahu antardasha can embroil him in some controversy . Finally even though I have no authentic proof , still I would say that this chart matches more with past life of PM Modi than the prevailing official birthdate based chart ! I have written many times on quora that narendra Modi has no rajyog as per his prevailing Birth Chart. Just a good time sometime enjoyed by many politician. see the situation of Hitler, Himler, Stalin,Roosevelt, Stalingrad, Winston churchill, Indira Gandhi, Rajiv Gandhi , Saddam Husain and many more after their rise at peak. Hitler even forced to suicide. So it was just a good time of Narendra Modi and not any RajYog established by any of the Horoscopes. Even Venus and it’s owner Zodiac Sign Libra and Taurus are the first enemy of Ascendant Leo so Venus will also not cooperate much. It was just a fluke. What ever he get whether Reputation, Administration, Honor everything will go in vain and of no use. You still have to analyse more. He will face more disgrace and dishonor then what honor and grace he got. Just check again everything. How do you define good time of these politicians if not by Rajyoga. Rajyoga does not make anyone immortal or invincible.